How-To-Tie packs make it easy to start fly dressing. Aimed at all levels, beginner, intermediate and advanced fly tiers. 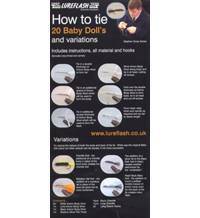 Thinking of starting to tie your own flies and don't want to buy loads of materials to tie your own flies? Well, why not buy some of these superb fly tying packs. Each pack contains full tying instructions with all the materials you need.